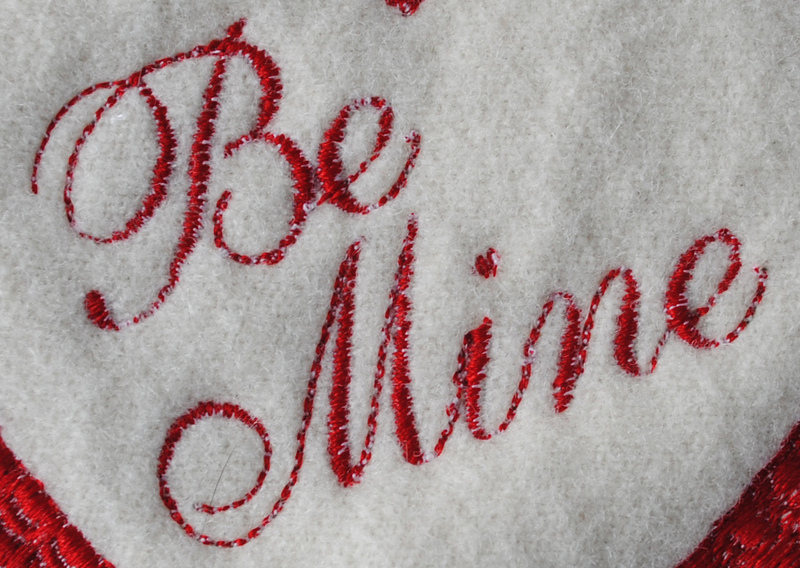 This week, I thought I would share some problems I had with stitches sinking into the design while creating the Scalloped Valentine project. I love to use wool felt in many of my projects. 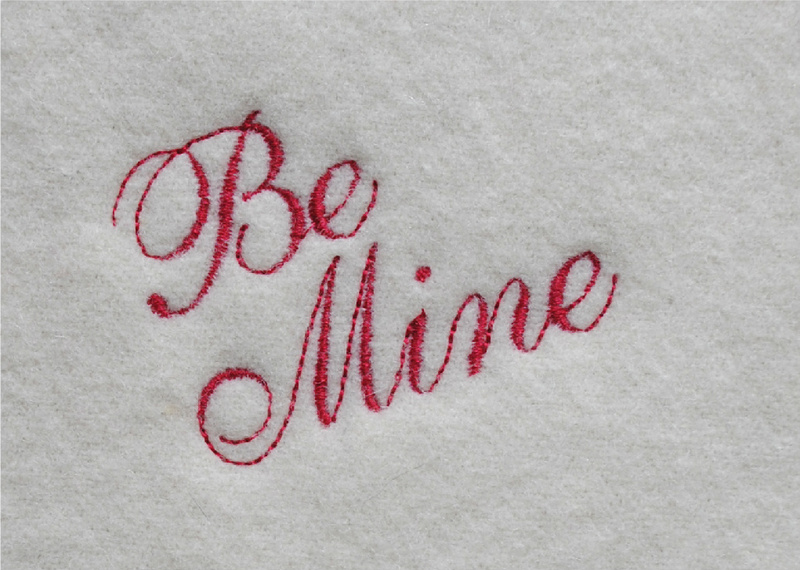 The cream-colored wool I used in the Scalloped Valentine projects was felted, meaning it had been washed in hot water and dried in the drier to shrink and compress the fibers. When felted, wool has more of a pile (depth) and nap (fuzzy surface) and that can create problems with stitches sinking out of sight. It is important to always create a test stitch-out. My first stitch-out was sub-par as you can see. One of the advantages of using a topper, whether it be water-soluble or heat-away, is that it keeps the embroidery on top of the pile. If the embroidery sinks in, fibers can lay over the stitches giving the design a less than crisp appearance. I experimented with using a water-soluble topper (below) with better results. 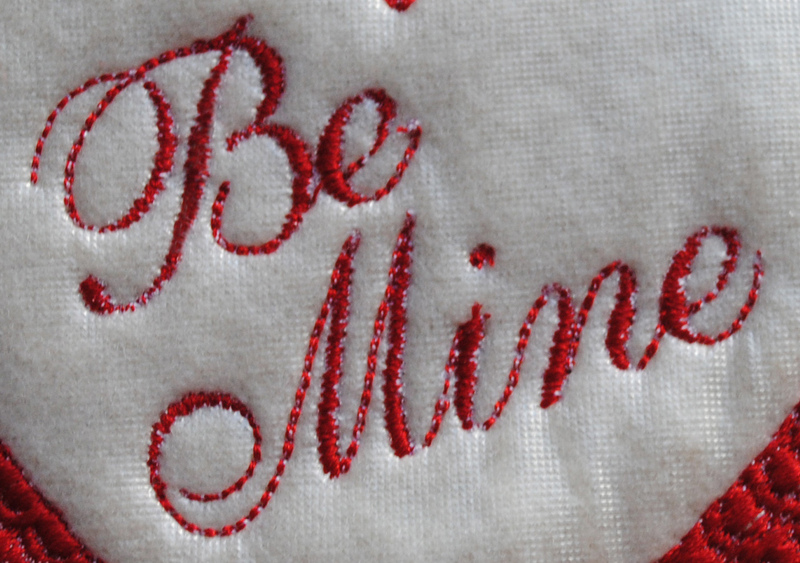 I pinned water-soluble stabilizer on top of the hoop before stitching the "Be Mine" text. When done, I removed the big pieces and soaked the rest away. The best result came when I changed from usint a 40-weight rayon embroidery thread to a 50-weight cotton thread and no topper whatsoever. I know, it doesn't make sense that a thread that is more fine than the first would show better. I believe the difference was in the thread type rather than the thread size. The cotton thread definitely gave the best finished product. It pays to experiment a little!